As a leading provider of network equipment for SMBs, NETGEAR understands the importance of providing great choice of PoE port counts and power budgets that can adapt to the business’s needs, whether in the hospitality, catering, education or retail domains. 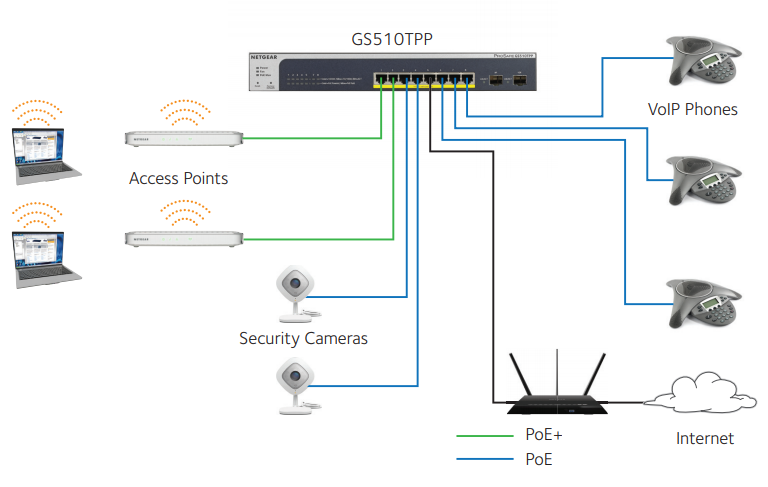 Organizations who buy infrastructure for the long term and want future proofing for the unforeseeable can require GS510TPP 8-Port Gigabit Smart Managed Pro Switch with PoE+ and 2 SFP Ports: 190W PoE budget offers more headroom. Temperatureand load-based fan-speed control combines accurate monitoring with minimized system acoustic noise: unlike other high power PoE switches on the market, the GS510TPP supports quiet desktop operation or rack mounting with a maximum of 32dB at full power and 25°C (77°F) ambient. The NETGEAR PoE+ Gigabit Smart Managed Pro Switches provides a great value, with configurable L2 network features like VLANs and PoE operation scheduling, allowing SMB customers to deploy PoE-based VoIP phones and IP surveillance. Advanced features such as IPv4/IPv6 Layer 3 static routing, DiffServ QoS, LACP link aggregation and Spanning Tree will satisfy even the most advanced small business networks. 1000BASE-T Copper Ethernet PoE+ connections Support high-density VoIP, Surveillance and Wi-Fi AP deployments, scalable for future growth. Never face the risk of running out of PoE ports. 1000BASE-X Fiber SFP ports Two dedicated Gigabit SFP ports for aggregation to the network core. Support for Fiber and Copper modules. Low Acoustics Fan-less design, or temperature- and load-based fan-speed control allow for quiet operation in both desktop or rackmount configuration. Energy Efficient Ethernet (IEEE 802.3az) Maximum power reduction for ongoing operation cost savings. Comprehensive IPv6 Support for Management, ACL and QoS Build current network with future in mind. Ensure investment protection and a smooth migration to an IPv6-based network without switch replacement. IPv4 & IPv6 Static Routing A simple way to provide segmentation of the network with internal routing through the switch - reserving the router for external traffic routing only, making the entire network more efficient. Build a secured, converged network with all types of traffic by preventing external attacks and blocking malware while allowing secure access for authorised users. Advanced controls for optimized network performance and better delivery of mission-critical traffic such as voice and video. Auto-VoIP, Auto-Voice VLAN, and Auto-Video VLAN Automatic Voice over IP prioritization (Auto-VoIP) simplifies most complex multi-vendor IP telephone deployments either based on protocols (SIP, H.323 and SCCP) or on OUI bytes (default database and user-based OUIs) in the phone source MAC address, providing the best class of service to VoIP streams (both data and signaling) over other ordinary traffic by classifying traffic, and enabling correct egress queue configuration. Similarly, Auto-Video VLAN enables IGMP snooping to minimize broadcast streams. IGMP Snooping and MLD Snooping Facilitate fast receiver joins and leaves for multicast streams. Save cost and improve network efficiency by ensuring multicast traffic only reaches designated receivers without the need of an extra multicast router. Protected Ports Ensure no exchange of unicast, broadcast, or multicast traffic between the protected ports on the switch, thereby improving the security of your converged network. This allows your sensitive phone phone conversations to stay private and your surveillance video clips can be forwarded to their designated storage device without leakage or alteration. DHCP Snooping Ensure IP address allocation integrity by only allowing DHCP messages from trusted DHCP servers and dropping malformed DHCP messages with a port or MAC address mismatch. Dynamic VLAN Assignment (RADIUS) IP phones and PCs can authenticate on the same port but under different VLAN assignment policies. Users are free to move around and enjoy the same level of network access regardless of their physical location on the network. Dual Firmware Images and Configuration Files Dual firmware images and dual configuration files for transparent firmware updates/configuration changes with minimum service interruption. * This product comes with a limited warranty that is valid only if purchased from a NETGEAR authorised reseller, and modifications to product may void the warranty; covers hardware, fans, and internal power supplies - not software or external power supplies; see http://www.netgear.com/about/warranty/ for details. Lifetime technical support includes basic phone support for 90 days from purchase date and lifetime online chat support when purchased from a NETGEAR authorised reseller. ** The NETGEAR OnCall 24x7 contract provides unlimited phone and email technical support for your networking product. For ProSAFE products purchased prior to 06/2014, also includes next business-day hardware replacement. Why NETGEAR PoE+ Smart Managed Pro Switches? The new standalone GS510TLP, GS510TPP and GS418TPP switches are designed with varying PoE port counts and PoE power budgets to meet the current and future needs of wireless converged networks. Within small and medium-sized organizations, there is growing adoption of PoE devices such as VoIP phones, IP security cameras, wireless access points, proximity sensors, LED lighting, door locks, and other IoT devices that require network switches capable of supporting dense PoE installations. Wireless access points and pan-tiltzoom HD cameras using Wave 2 802.11ac Wi-Fi also require PoE+ power (802.3at), increasing the power demands on PoE switches. “PoE devices are putting a strain on switching power demands.” As a leading provider of network equipment for SMBs, NETGEAR understands the importance of providing great choice of PoE port counts and PoE power budgets that can adapt to the business’s needs, whether in the hospitality, catering, education or retail domains. These switches provide a great value, with configurable L2 network features like VLANs and PoE operation scheduling. Advanced features such as IPv4/IPv6 Layer 3 static routing, DiffServ QoS, LACP link aggregation and Spanning Tree will satisfy even the most advanced small business networks. 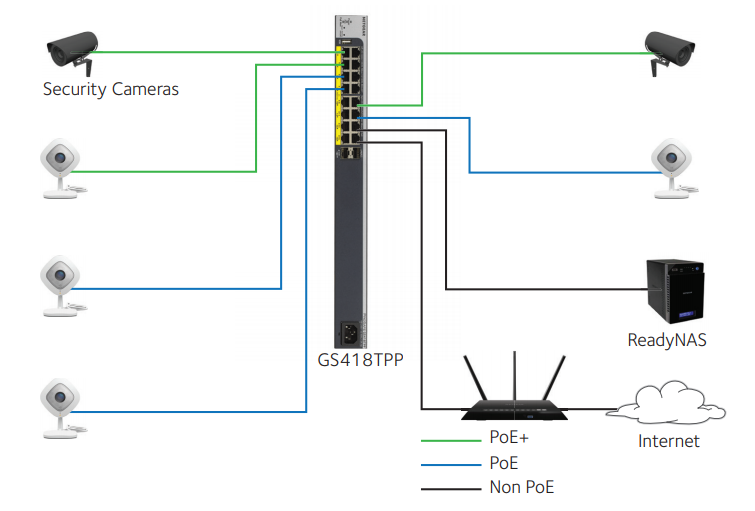 Download the NETGEAR Gigabit PoE+ Smart Managed Pro Switches Datasheet (PDF). NetGuardStore.com.au is a division of Virtual Graffiti Australia Pty Limited, an authorised NETGEAR online reseller.